The roads can start to deteriorate and have issues as the spring weather arrives. This is because of the freezing and thawing that the roads go through over a few months. The result can be potholes that you will want to avoid or drive around if at all possible. You cannot always determine how deep or shallow a pothole may be. If it is really deep, it can do damage to the tires and front end of your vehicle as you drive over it. Slow down if you see an upcoming pothole so you can go over it more carefully. 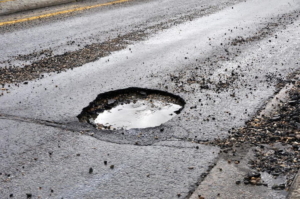 When you hit a pothole, the tires are the first part that might become damaged. Since they are the part that will make direct contact with the road, and will hit the pothole. Besides risking the tire blowing, hitting a pothole can cause damage to the sidewalls of the tires as well. Even a small scrape or bulge can develop into a much worse problem over time. Make sure to schedule your vehicle for an appointment so we can inspect it fully for you. As the tires hit the pothole, then the alignment may also become damaged as well. When the vehicle does not travel straight when the steering wheel is straight, it can indicate an issue. It is always best to bring the vehicle in so we can check the tires and alignment. Part of regular tire maintenance includes having the tires aligned. If you hit something that throws that off, then an adjustment will be needed sooner for your vehicle. When the tires are aligned properly, then they will wear correctly as well as you drive. If you ever notice any problems as you drive, always make sure to schedule an appointment so we can inspect the vehicle for you. This entry was posted in Pothole damage, Safe Driving Tips, Spring, Vehicle Safety Inspection. Bookmark the permalink.